Looking for a quick and easy recipe that pack and freeze well? 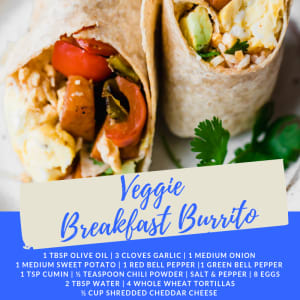 Then be sure to try out these amazing breakfast burritos. Add oil to a large skillet over medium heat and add in garlic, onion, sweet potato, red bell pepper, green bell pepper, cumin, chili powder and salt and pepper; stir together to coat the veggies with the spices, then cover and cook for about 10 minutes, stirring occasionally, until sweet potatoes are fork tender. Remove from heat once done cooking. While veggies are cooking you can make your scrambled eggs. In a medium bowl, whisk together the eggs, water, salt and pepper. Coat a nonstick skillet with cooking spray and place over medium low heat. Add in eggs and cook, folding every 30 seconds or so until the eggs are fluffy, then remove from heat and set aside. To assemble the burritos: Lay out the tortillas and evenly distribute the eggs and veggies. Add 2 tablespoons cheese and 1⁄4 avocado to each burrito (if using). You can also add hot sauce or a little salsa if you’d like. Tuck ends in, then roll up burritos. To warm up: Place on baking sheet in oven at 325 degrees for 5-10 minutes or simply microwave them for a minute or two. Serve with sour cream, greek yogurt, salsa, or hot sauce. One Serving Equals: 448 calories, 19.7g fat, 43.5g carbohydrates, 6.4g sugar, 6.5g fiber, and 22.2g protein.